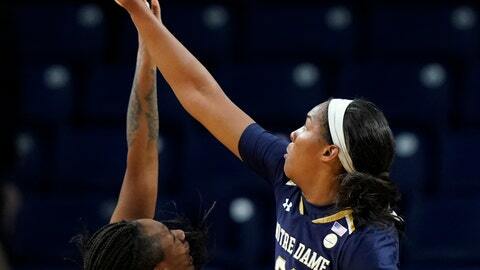 The tournament getting underway Thursday includes top-ranked Notre Dame, No. 9 Oregon State and No. 13 South Carolina. But it’s more than just the top of the field that makes it such a solid tournament in its first year. It also includes Rutgers and coach C. Vivian Stringer, who just picked up her 1,000th victory to become the fifth women’s Division I coach to reach the mark, and teams like Drake, Gonzaga and East Tennessee, who were all picked to win their conferences in preseason polls. In other words, this isn’t a pushover field for the elite teams to march through, even if the idea of a final featuring Notre Dame against either South Carolina or Oregon State would be an appealing early-season opportunity. The opening games feature Notre Dame vs. Gonzaga and Rutgers vs. Drake on one side of the bracket; and South Carolina vs. East Tennessee and Oregon State vs. Western Kentucky on the other half. The men’s half of the tournament wrapped on Wednesday, but ended up featuring just four teams playing a modified round-robin format. Originally, organizers hoped to have two eight-team fields for both the men and women, but they struggled to fill the men’s field. There wasn’t the same problem on the women’s side. The Irish haven’t shown any reason they shouldn’t be No. 1 and haven’t let last year’s title linger into this season so far. Gonzaga has never knocked off a No. 1 team and this will be its fourth chance. But the most interesting first-day game to watch could be Rutgers against Drake. Stringer won her 1,000th game last week in a blowout win over Central Connecticut State. But Drake is on the cusp of breaking into the AP Top 25 — the Bulldogs’ were the fourth team outside the poll this week — and a good showing in Vancouver could land them in the poll.